A fan podcast for the HBO TV series Game of Thrones. Season 8 arrives and the power map is flipping! The North offers a cold welcome to Khaleesi and her entourage of dragons, foreign fighters and questionable counselors. In the south, Cersei lands a Golden Company and wrestles a Sea Creature, but the Elephants are a no-show. 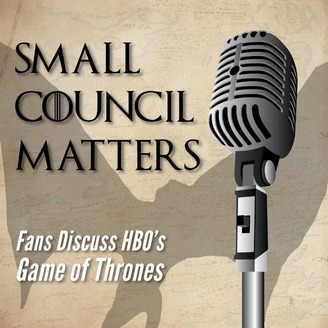 Wendy and the other Small Council maesters (Christine, Jesse, Shannon) discuss the awkward meetups, divisive questions and incendiary family news in episode 801 ‘Winterfell’. Contact the Small Council by leaving a speakpipe audio message or voicemail at 706-927-8478. 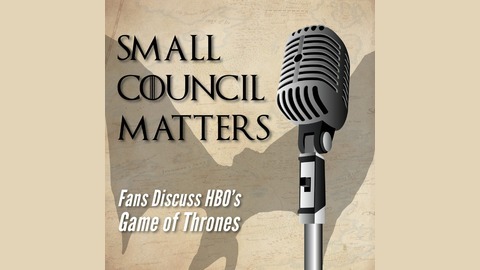 Send tiny ravens to the Small Council Matters Podcast @SCM_Pod on Twitter. Missed a previous episode? Here are all the Small Council Matters podcasts. Hosted by Wendy Hembrock. Recorded on 4/16/2019. Edited by Brent Barrett.